My fifth solo release is a terminal point for the previous four. Once again, my musical compass points in all directions of the globe - including the celestial this time. Some of the music was charted, some was improvised, so the concept of old world navigation and journeys of exploration seemed appropriate. 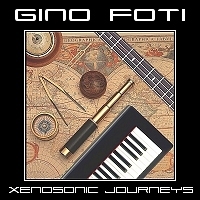 Most of the album features compositions with two bass guitars playing simultaneously, in various configurations: fretted & fretless, dry & effected, rhythm & lead, etc., with the rest incorporating newer genres and styles, such as: ambient, downtempo, electronica, techno, trance, et al. to my fusion of jazz, rock and world music, in an effort to play outside my comfort zone, and improve as an overall player and arranger. The arrangements were achieved primarily through three methods: symbiosis, syncretism, and synthesis. Interactions between instruments were maximized, hopefully to the advantage of all; arrays of differences were aligned, such that likeness might be found among the unlikely; and disparate elements were fused together, trying to form a coherent whole. A decade has now passed since I embarked on this voyage, and it is finally over. Time to begin a new one. Click on the song titles to stream music samples. "If some messenger were to come to us with the offer that death should be overthrown, but with the one inseparable condition that birth should also cease; if the existing generation were given the chance to live forever, but on the clear understanding that never again would there be a child, or a youth, or first love, never again new persons with new hopes, new ideas, new achievements; ourselves for always, and never any others -- could the answer be in doubt? We shall not fear the summons of death; we shall remember those who have gone before us and those who will come after us. Alas, for those who cannot sing, but die with all their music in them. Let us treasure the time we have and resolve to use it well, counting each moment precious - a chance to apprehend some truth, to experience some beauty, to conquer some evil, to relieve some suffering, to love and be loved, to achieve something of lasting worth. A pan-Mediterranean composition that began with a leftover percussion arrangement from the Orbis Terrarum sessions, featuring doumbek and riq (hand drum and tambourine) playing Cheftitelli, Malfuf, Ayyub, and Karshilama patterns over various tempos and a few different time signatures. For the first part, acoustic piano and a second bass guitar were added to the original melodic & rhythmic fragments played by bass and oud (a main instrument of Arabic/Middle-Eastern music, and ancestor of the European lute), as well as synthesizers in a few sections. For the second, fretless bass and piano are the primary instruments over a similar foundation. The balance between the individual instruments and the two parts worked out well: the first is more laid-back and reminiscent of Arabic music from centuries past, while the second is more aggressive and has a contemporary jazz-rock fusion sound. Or the color of your shirt. The arrangement of fretted & fretless bass guitars, acoustic piano, drum kit, and hand percussion features the Dangdut rhythms from Indonesia. Originally derived from Arab, Indian and Malay folk music, it has recently been influenced by Latin, R&B, house music, and other modern/urban styles, making it a perfect vehicle for the title concept. Unlike modern Dangdut, which dominates Indonesian pop culture and is based around singing and dancing, my composition is influenced by up-tempo rock and improvisational jazz, with tinges of African, Asian, and Indian music, and chord progressions from Latin jazz and folk music throughout the Mediterranean, in keeping with the cultural diversity of this genre. Every hair-tip encompasses oceans of past, present and future. In Hinduism and Buddhism, there are deities who rule the ten directions: north, south, east, west, the four points in between, and the zenith and nadir. The former has the Dasa-dikpala - the Guardians of the Directions, as well as Devi Durga - the Mother Goddess usually depicted with ten arms, suggesting that she protects all devotees from any direction. The latter has the Buddhas of the Ten Directions, as referred to in the Lotus Sutra. Part I is a miniature composition featuring shakuhachi, the Japanese bamboo end-blown flute, over a synthesizer bed, built around a leftover from the Bhavachakra sessions. Part II showcases electric guitarist Dave Kulju and interweaving bass guitars, playing over a tabla set, Indian cymbals, tanpura drones, and shakuhachi. The former was influenced by Zen Buddhist music, called honkyoku, which tends to reflect the full dynamics of nature; the latter by Hindustani music - a raga system indigenous to Northern India that was originally influenced by Persian and Arabic music. In consonance with Hindustani tradition, an improvised portion that features fretless bass was juxtaposed to the formal composition. The skeletal arrangement for this composition dates back to 2002 or 2003, when it was conceived as a possible composition for Electrum - my instrumental progressive rock band. At some point, a drum kit playing Latin-flavored rock patterns was added to the two bass guitars riffing in D Dorian mode to complete the basic rhythm section. At some other point in time, congas and cowbells were included, giving the tune more of an Afro-Cuban Latin ethnicity. Years later, the piece was handed over to my Electrum counterpart, Dave Kulju, to add electric guitars, which steered the composition back towards the rock genre. In between all of the above, this piece was slated for termination several times, but somehow always managed a reprieve. There was also a title change... or two? Hell, even I don't remember anymore. In late 2012, after a preliminary mixdown, a timbales lead break was added to spice up a transition section, and of course -- more cowbell! Ten years to realize six minutes worth of music?? Luckily, Dave and I feel it was worth the wait. Months into this project, I became weary with the compositional process using loops, which tend to lead the arranger to constant repetition of not only measures and passages, but entire sections. I decided to use my favorite musical form - the rhapsody - within a loop-based universe. That decision took only a few seconds to make. The second part of this composition alone took what seemed like a span of geological time, as I found myself slicing and dicing drum kit and classical guitar loops (down to the 32nd note in some cases), while being forced to edit "completed" parts at the millisecond level, to get rid of unwanted noises and sonic artifacts left behind by all my digital surgery. 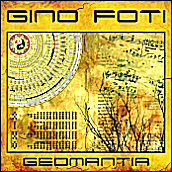 The original arrangement was comprised of bass guitar playing jazz-rock fusion, classical guitar playing Latin & flamenco rhythms, and a drum kit playing in the progressive rock style - directly influenced by Scott Rockenfield of Queensrÿche, Neil Peart of Rush, and my Electrum bandmate, Joe Musmanno. Since another one of my favorite compositional tools is the use of odd meters, I sketched out a spacious bass solo section that uses 9/8, 11/8, and 19/16 time signatures. (What was I thinking?) There was just no way to take the common time drum loops I was using, and have them make any musical sense in this odd framework. Using individual kit samples sounded too detached, like they were not being played by the same person - or for that matter any human drummer - so keyboards were added underneath. Now the section sounded a bit out of place to me, even as part of a rhapsody, so I composed a short introduction with the same basic keyboard sounds. Well, the short intro grew into a long introduction, which then balooned into an entire movement, but was eventually edited down to what became Part I. Although it took much longer than I anticipated to complete this piece, I am happy with the result, especially the bass guitar arrangement. This composition began as a duet with bass guitar and female voice, but with the overwhelming majority of the bass arrangement played in the upper register, I felt that there was something fundamental missing. Even after supplementing it with some simple root-octave ideas in a different tone, and slightly panning both bass guitars, it didn't sound quite right to me, so I included hand percussion in the Carnatic tradition - a system of music usually associated with Southern India, where the main emphasis is vocal music. The singing is based around the Hindi word for music: sangita (or sangeeta, sangeetha), which gave me the idea for the title. Saraswati is the Hindu goddess of music and the arts, as well as speech and learning, and is the creator of Sanskrit - the language of the Vedas, among other attributes. She is usually depicted with four arms, two of them playing the veena - an ancient long-necked lute. As the consort of Brahma, the creator god of the Hindu Trinity, and revered by all Dharmic religions, it's an excellent tie-in with conceptual ideas on this release, as well as the previous four. After a rough mixdown, I ended up altering the lead bass guitar a little, to help feature the interrelationship between all the instruments, and keyboards were added at the beginning, before the percussion & basses enter. For once, all my late-stage changes were favorable, and I am extremely pleased with the end product. "For each one of us stands alone in the midst of a universe. He is surrounded by sights and sounds which he interprets as exterior to himself, although all he knows of them are the impressions on his retina and ear drums and other organs of sense. The universe for him is measured by these sensations; they are, for him, the universe. Some of them he interprets as denoting other individuals, whom he conceives as more or less like himself. But none of these is himself. He stands apart. His consciousness, and the desires and gratifications that enter into it, is a thing unique; no other can enter into it. This composition acts as a line of delineation on this release. As I wrote earlier, in an effort to do something different, and hopefully improve as both musician and arranger, I decided to add electronic, urban, and even dance-based genres/styles, like: ambient, downtempo, electronica, techno, and trance to my sonic palette, and the second part of this piece turned out to be my first effort in this vein. As the title suggests, Part I is a synth-heavy soundscape influenced by ambient, space, and electronic music, as well as sounds from our universe that have been emitted and processed through probes & spacecrafts like Cassini, Galileo, and Voyager over the years. Towards the end, tabla and bass guitar fade in as it transitions to Part II, which features acoustic piano and fretless bass as the lead instruments, alternating between techno-influenced call-and-response passages and ambient-based lead break sections, all backed by synthesizers and electronic percussion. The second half of this part includes female synth vox, which once again gave me the idea for the title, after the Goddess of Mercy, Guanyin. In Pure Land Buddhism, she is described as the "barque of salvation". Along with Amitabha Buddha (a direct tie-in to my Bhavachakra release), she can liberate beings out of the Wheel of Samsara temporarily, where they have the chance to accrue enough merits to become a Buddha. The name is short for Guanshiyin, meaning "observing the sounds (or cries) of the world". The title - Spanish for "The Coexistence" - is a term used to describe a period of history in Spain when Christians, Jews, and Muslims lived in relative peace and harmony within its different kingdoms. It refers directly to religious tolerance, although in some cities like Córdoba, Granada, and Toledo it included the interplay of cultural ideas, and appreciation for their respective secular philosophy, art, science, technology - and of course, music. My original idea was to take a song from that period and use it as a point of departure, but a cursory Internet search revealed that there were many artists/bands performing the original music, as well as variations. Since Part I of the leadoff track sounded like it could have been written in old Andalusia, I decided to experiment by using modern-sounding musical fragments from throughout the Mediterranean and Middle East, since they also integrate electronic genres. What I ended up with was a rhythmic bed of synthesized percussion, guitar, bass, and classical guitar. The arrangement sounded good, but I thought it could use an old-world element or two, and after playing around with various doumbek rhythms, I found Saidi patterns to be the best choice available. With four main sections, I divided the primary voices between bass guitar, classical guitar, fretless bass, and electric guitar, each bringing a different element to the mix: Mediterranean folk, flamenco pop, jazz fusion, and rock, respectively. The end result was pleasing to me, considering this was an experimental composition, and I usually end up deleting most of this ilk. I sketched out some notes on what could be improved or could be changed, but given my prior history in similar musical situations where my returns were diminished, and I ended up destroying things by "improving" them, I left it as is. Symbiosis is primarily a biological term that refers to the habitual cohabitation of organisms of different species, usually meant as a relationship that is beneficial to both members. For this piece, a single-celled fretless bass guitar plays rhythmic, melodic, and harmonic ideas over a multicellular organism made up of electronic beats, arp melodies, arp rhythms, blips, FX, glitches, hits, noises, pads, textures, etc. Once again, although I liked the overall arrangement, the lack of world music elements bothered me, so I decided to splice some ethnic percussion genes to the DNA of the synthesized organism. My experiments found that the ghatam - a clay pot used in Indian music - was a great complement, but since I had already written several compositions with Indian percussion, I switched to the udu, the clay pot drum from Nigeria. Traditionally, udus were used to carry water, but at some point a hole in the side of the vessel was created, changing the musical implications of the instrument. By simultaneously striking the opening on the side, while closing the opening on top with the other hand - in varying degrees - a myriad of tones could be achieved: from soothing to intense, from subtle to downright eerie. The ethereal sounds of the udu turned out to be the perfect choice for this piece. Wayfaring, in nautical terms, is where information about the sun, stars, planets, the movement of ocean currents, wave patterns, and trade winds were used by ancient mariners. The skeletal arrangement dates back to 2005, during the Sphere Of Influence sessions. The original Latin-influenced percussion arrangement was deleted, substituted by a tabla set and atmospheric electronic percussion. To this, many layers of synthesizers were added, some with Indian spices. With the foundation complete, I added bass guitar to round out the rhythm section, then acoustic piano as the main instrument, and finally, a fretless bass solo spot. The result struck me with astonishment... but not in a good way. I had created an extremely thick chorus of voices, but closer to cacophony than concord. Besides the clashing of the primary instruments, all of the subtleties of the synths were lost in the din. This is a problem that I have run into before, a direct result of being a solo artist and wearing too many hats at the same time. Objectivity is difficult to retain when you are the composer, arranger, every member of the band, audio engineer, as well as the producer. In the past, I have simply written and recorded new parts. Eventually, the rough edges get smoothed out as the composition slowly reveals to me which path it wants to take. This time, because the atmospheric synths are a large part of the essence of the piece, that strategy did not work. Just like in Crane's versanelle, it became painfully obvious that I had to abandon this road, and travel an easier path. The elaborate bass guitar arrangement was changed to a root-based "meat and potatoes" part. Piano was removed entirely from the first section, and the rest rewritten in a more airy fashion. The fretless solo was kept as recorded, but the fretted bass underneath was deleted to make more room for the synthesizers, which were already highlighting the chord progression. Tabla was changed to mostly "no frills" patterns. Also, a few layers of synthesizers - once considered important, now labeled as needless - were dissipated into the aether. File under: Less is more. "The cold kiss of Janus brushes my face. Against the empty lavender skies. To veil the night’s gasping face. Janus sits above the gates of time. The second part of this composition is a conceptual piece built around the Tzolk'in divine calendar of the Mayans, which combines a cycle of thirteen numbers with another cycle of twenty named days, still used for sacred rituals and agricultural planning. The arrangement also becomes more complicated as it goes along, with the second half featuring a call-and-response section between three instruments: fretless bass, acoustic piano, and lead synth over a number of measures that get shorter with every round, transitioning into several "touch and go" sections with bass guitar, fretless bass, and piano as the lead voices, that are more syncopated. Due to its complexity, I needed a drummer who could handle all these twists and turns, and I was fortunate enough to have piqued the interest of my label mate, the immensely talented Massimo DeAngelis. Mixing this tune proved to be extremely challenging, and I was left with three slightly different choices. In the end, I chose the mixdown with about 1 dB more percussion, as it propels the composition forward, and Massimo's arrangement - all played on V-Drums as one take - was too brilliant to be even-weighted or undermixed. The heart of this composition is a leftover from the Vedic Mantras sessions, with a new synth arrangement for Part I, and an improvised Rhodes piano (an electro-mechanical piano invented by Harold Rhodes in the 1950s) added to the old synthesizer beds of Part II. Since this release acts as a conclusion for my past albums, I thought it would be a good addition since the stotras, or hymns of praise, chanted are to Lord Shiva - the destroyer or transformer god of the Hindu Trinity, and the symbolism and aspects he represents are closely associated to compositions in this release (e.g. Saraswati is the daughter of Lord Shiva and Devi Durga, the Goddess of the Ten Directions), as well as the previous four. Many concerts and recitals in India conclude with a mangalam - a sacred song of salutation, performed in a spirit of gratitude for the welfare and prosperity of the world.